Weekly flow advice, daily lakes recordings, barrage operations, Calendar of events. 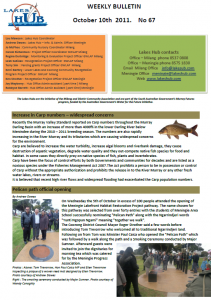 This entry was posted in Lakes Hub Bulletin, LakesHub, Meningie, Milang, Newsletters, Turtles & other Fauna, Water, ph & salt levels. Bookmark the permalink.